Need a flexible coding option for both primary and secondary packaging? 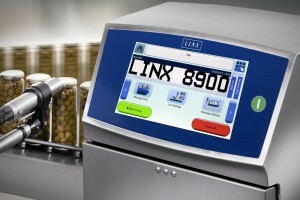 Check out the new Linx 8900 continuous inkjet printer. Able to code three lines of text and numbers, barcodes and symbols from just 1.8mm up to 20mm high, this flexible coding option is easy to use, reliable and efficient. Plus its long, eight-hour, fluid-refill warnings mean you can plan refills around your production schedule. See how else this CIJ coder will let you spend more time coding, to increase output from your production line. Not only can you plan refills around your production schedule, the Linx 8900 CIJ’s long fluid refill warnings mean no more unexpected printer stops. Code creation is intuitive with simple icons on the large, colour touch-screen, which has drag-and-drop field positioning. The icons can be customised on the top screen so the most frequently used features are just a single touch away. Fluid refills are quick and clean, with no tools needed, no mess and no mistakes. To change cartridges, the door simply opens at a touch, and cartridges click into place. Automatic fluid-checking also ensures the correct fluid is used. Servicing is quick and simple with the Easi-Change® Service Module. This can be changed in minutes following step-by-step, on-screen instructions. This is another way the Linx 8900 allows you to schedule in servicing around your production runs, resulting in less downtime. The Linx 8900 can help you track line productivity by monitoring the printer output based on your own targets in real time — for example, batch counts or output-per-hour rates. The screensaver clearly displays whether production is on or off target. Linx’s proven reliability gives maximum uptime. The print-head’s robust, sealed design, made from stainless steel, always protects all essential components. Cleaning is only needed every three months. The Autoflush feature ensures the print-head is cleaned thoroughly at every shutdown, ensuring reliable operation and first-time start-up, even after extended shutdowns. If you have any questions about the Linx 8900 CIJ, any other coder, or how these can be integrated into your business, contact Matthews today. Or call 1300 CODING (1300 263 464).